Learning a new language isn’t easy; it takes a lot of patience, time, effort and a good teacher. The other challenge? Just as the definition of a “good” teacher varies depending on the student, there usually isn’t a “right” way to learn (or teach) a new language. As the Web and its content distribution and communication channels have matured, a litany of language learning programs, apps and startups have emerged, utilizing these new tools and technologies to revolutionize the way we learn to speak a new language. Of course, because language study tends to resist a one-size-fits-all approach, there are about as many startups (and educational resources) as there are learning styles. While their methods differ, they do tend to have one goal in common: To reach the largest possible audience, popular apps like Duolingo usually focus on the most widely-spoken languages, beginning with English. OKpanda, a new language-learning startup that will launch later this year, wants to stand out from the crowd by focusing on one particular market — where, historically, native speakers have struggled to learn new languages. Co-founded by serial entrepreneur and app developer Adam Gries and Nir Markus — the former co-founder and CTO of popular multiplayer-games-as-a-service startup PlayerDuel — OKpanda is on a mission to change the way people learn English in Asia — specifically, Japan. Thanks to fundamental differences in syntax, grammar and punctuation — and culture — learning English can be extremely difficult for native speakers of Japanese. Despite learning English is mandatory for Japanese students from age six to 12, TOEFL scores in Japan are “among the lowest in Asia.” Even though English instruction is compulsory across the country, co-founder Adam Gries tells us, in studying the language learning market in Japan, the team found that native speakers still have a relatively low command of spoken English. Part of the reason for this, he explains, is that most Japanese teachers don’t speak the language or have a firm command of everyday usage themselves, making language acquisition all the more difficult for students. What’s more, he says, regular exposure to English is infrequent for most students, which is compounded by a focus on teaching a more “decorative” or academic version of the English, rather than for real, or more functional application. Of course, OKpanda is hardly the first English language learning service to tackle the Japanese market, and many are just beginning, with Teamie and Nihongo Master being just a few recent examples. Nonetheless, the OKpanda co-founders believe there’s still plenty of untapped opportunity in Japan, especially considering the dearth of services offering adequate conversational practice in modern, colloquial English, he says. There’s another reason for optimism: The size of the market. Today, Japan is one of the largest language learning markets in Asia — second only to China — with approximately $5 billion being spent on language services, not including peripherals like translation and test prep. And, with these peripherals included, the total market increases to $8 billion. As globalization continues to rise, Japan is also experiencing increasing demand for English-learning among businesses and working professionals. Rakuten and Uniqlo, two multinational Japanese giants, for example, recently introduced English-only policies for all company communications. In other words, both companies now require employees to speak English when communicating with their colleagues. As an increasing number of Japanese companies now operate at a global scale, their leaders are eager to reflect the changing global marketplace and workforce, and Gries says that there’s a sense in Japan that, when it comes to English fluency, Japan has fallen behind other industrialized nations — and its neighbors. 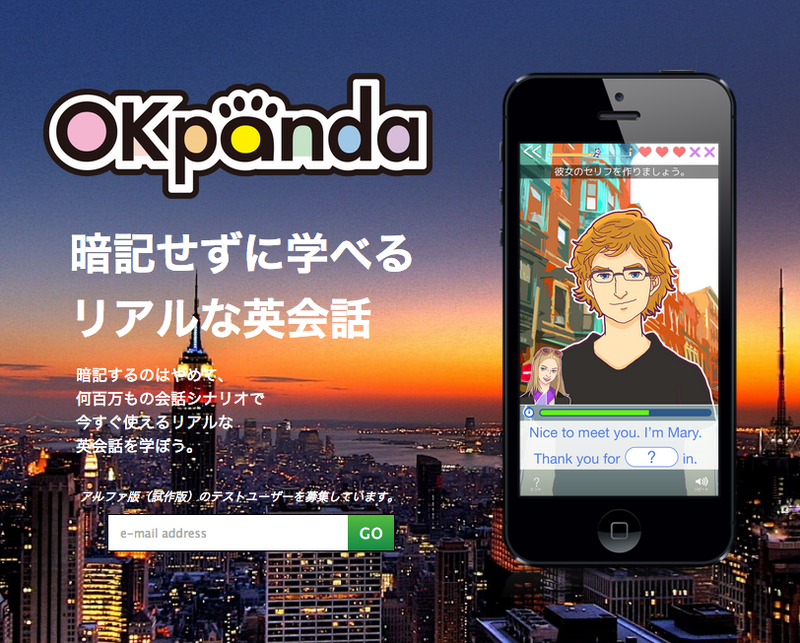 To meet the growing demand for better English language learning tools in Japan and help native speakers address the challenge of finding conversational practice in functional English, OKpanda is taking a mobile approach. The team is currently in the final stages of developing an iPhone app that helps users acquire these skills via hundreds of thousands of interactive conversations, which allow users to speak with avatars in “fully dynamic formats,” Gries says. The co-founders expect the app to launch before December and are starting on iOS in spite of the relatively low adoption of iPhones in Japan compared to other markets. While, historically, that would have been a risky move, lately Japanese carriers have begun to offer the iPhone, with a potentially huge step forward for iPhone adoption in Japan coming from NTT Docomo’s recent announcement that it will begin offering iPhone coverage to its customers. While the startup will start with an iPhone app and look to expand to other mobile operating systems thereafter, the team believes that taking a mobile-first approach is the right way to go when tackling Asian markets. Not only that, but when OKpanda goes live in Q4, the app’s language learning experience will focus primarily on teaching English via listening and speaking exercises and will offer an “innovative matrix of content” that will allow for realistic conversation variety — which Gries believes are key to appealing to an Asian market. Well that, and allowing students to learn conversational English by speaking to avatars from the comfort of their phone, an experience which the co-founders hope will make them feel right at home. Down the line, OKpanda plans to expand on its avatar method by offering live conversations with English speakers, although it’s not clear yet how they will implement this kind of live instruction. Gries also tells us that the app will be free to download and, though the team is still working out the best approach to monetiziation, he says that OKpanda will likely opt for a subscription model in the vein of Lumosity or Lynda.com. In the meantime, to support its mission in Japan and acquire the fuel it needs for launch and its first months in its new home, OKpanda has raised $1.4 million in a round led by Resolute Ventures, with participation from firms like Innovation Endeavors, Kapor Capital and 500 Startups. A handful of angel investors also contributed to the startup’s first financing effort, including the founder of Karma and Tapjoy Lee Linden, the former chairman of APAX Asia Max Burger, Producteev founder Ilan Abehassera and Mafia Wars co-founder Roger Dickey. To that point: Up until last week, the OKpanda team had been based out of offices in New York City, but the staff recently moved into new digs in Tokyo, which will become the startup’s new headquarters for “at least” the next few months, the co-founders tell us. Once its iPhone app launches, the plan is to expand to other Asian markets thereafter — likely at some point in 2014. And depending on how it goes, OKpanda could be headed beyond Asia later next year or the year after. OKpanda wants to make mobile language learning both fun and easy, and “these days Japan could use more of both, especially with the history of naughty companies that promise English learning but don’t deliver,” McClure says. To help it steer the course, Okpanda has also recruited an impressive advisory board to complement its new investors, which now include educational and user behavior experts including Professor Karen Price, formerly the Associate Director of Harvard English Teachers’ Program, Learnist founder Farbood Nivi and Farmville and Red Hot Labs co-founder Amitt Mahajan, among others. Finally, readers looking to test out the product and receive updates on the app’s progress (including its launch) should sign up on Okpanda’s homepage here.